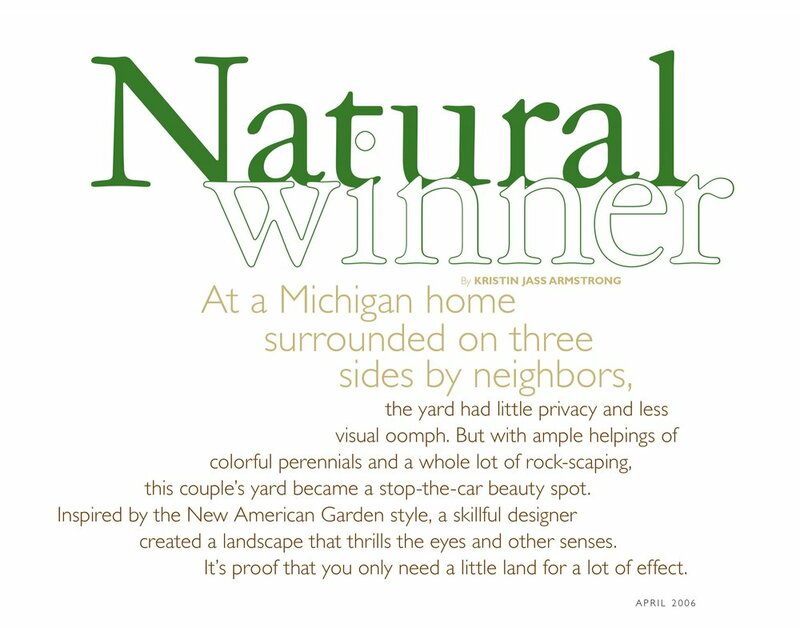 At a Michigan home surrounded on three sides by neighbors, the yard had little privacy and less visual oomph. 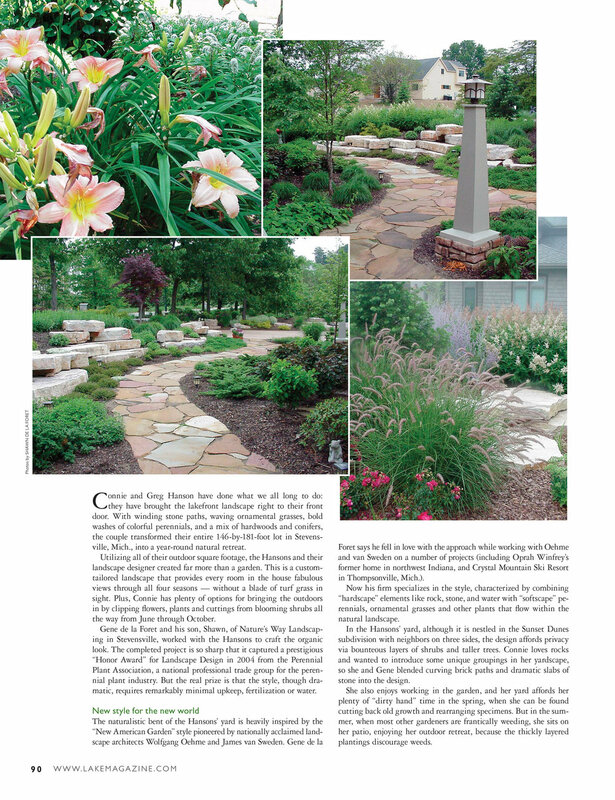 But with ample helpings of colorful perennials and a whole lot of rock-scaping, this couple's yard became a stop-the-car beauty spot. Inspired by the New American Garden style, a skillful designer created a landscape that thrills the eyes and other senses. It's proof that you only need a little land for a lot of effect. Hand pulling is the best method to eliminating weeds. Be sure to pull the entire weed, root and all. When fertilizing, read the instructions on the back of the bag for proper fertilizing techniques. Use a pre-emergent, such as Preen, in the spring to keep weeds from germinating. Do not allow your weeds to get out of control. This creates a headache for you later. Read the instructions before fertilizing. Do not fertilize after mid-August as it will push new, tender growth just before frost. Smart watering means healthier plants. Watering too much or not enough produces weak plants that are susceptible to pests and disease. Proper watering = beautiful landscapes. For efficient watering, water where the roots are located. Watering the plant's leaves can cause sun scald and fungal growth. Focus on watering the soil instead of the plant itself. Water trees and large shrubs slowly (for 1 hour), using only a trickle of water from the hose. Water deeply so the plant establishes deep, spreading root systems. Water should be applied as quickly as it can be absorbed by the soil. Applying too much causes erosion and wastes water. Check soil moisture using a moisture meter shown below to determine how much water should be applied. Stick the moisture meter 4 inches into soil. Apply a 2 inch layer of mulch around your plants to retain moisture. The soil should be allowed to briefly dry out between watering. Over watering literally drowns plants, rotting their roots and inhibiting nutrient absorption. 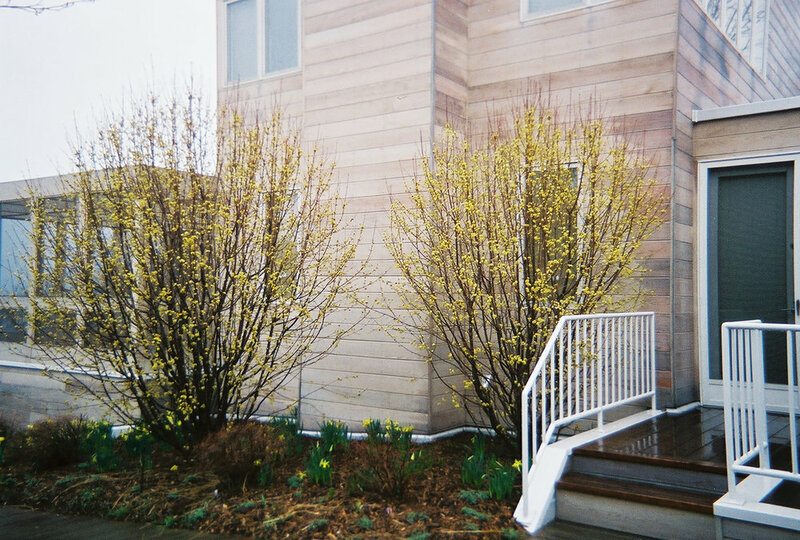 Large shrubs/trees: For summer installations, slowly soak daily for 1-2 hours per tree. For spring/fall installations, soak 1-2 times/week for the first year. 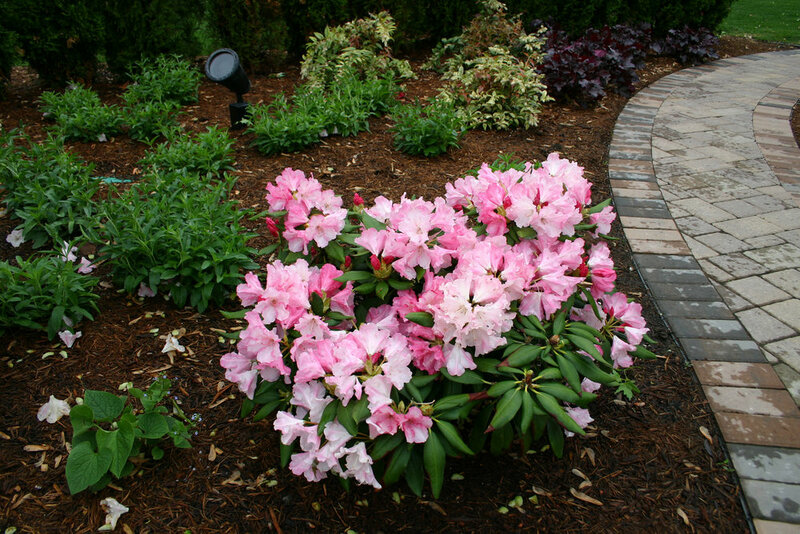 Small shrubs/perennials: 1-2 times/ week for the first two months after installation. Use a water meter shown at right to determine when to water after the first two months. Resist the urge to water! In the picture shown at right, the moisture meter shows that the soil is wet. Hot temperatures, not lack of water, are causing wilt. Use common sense - if it has rained significantly (1 in. or more), your plants do not need water. Likewise, if temperatures are 80 degrees and above for 3+ weeks without significant rain, check your plants for moisture. By the end of the month, all grasses should be cut to 6" high and perennials should be cut to the ground. Woody perennials should be cut back to stems that are 1/4" to 1/2" in diameter. Refer to our tips on pruning. Bulbs should be coming up shortly, so if you're planning on re-mulching, now is an easy time to get it done. This is also a good time to fertilize. For perennials and grasses, use a broadcast 20-20-20 slow release fertilizer. Any kind of tree or shrub "food" will do for trees and shrubs. Remember, the faster and healthier your plants grow and fill in the space, the less likely you'll be dealing with weeds later in the season. 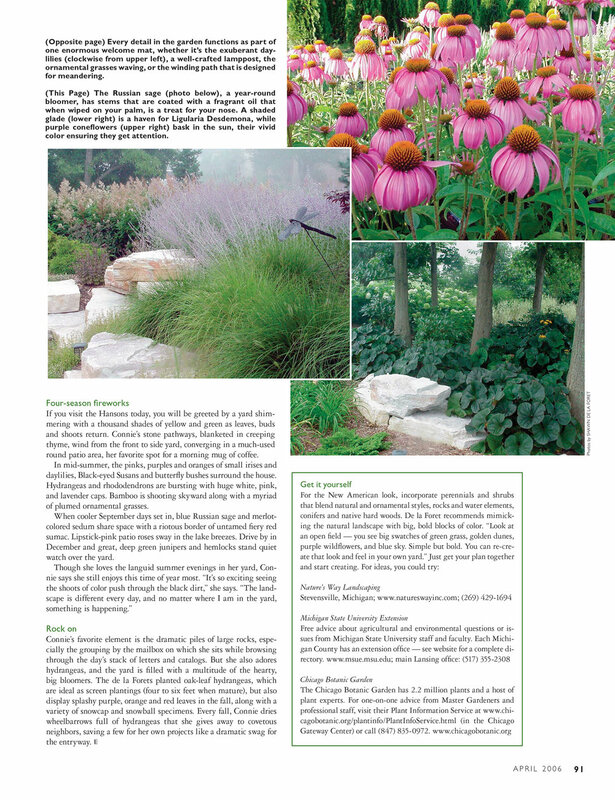 Refer to our tips on fertilizing. May is the perfect time to plant annuals. Our "annual crew" is available to decorate your pots and other planting areas with beautiful displays of color. Contact us for an estimate. Now is also the time to adjust your watering schedule. Most plants only need additional watering when we experience a period of several days without rain. Once established, plants will acclimate to the water provided by Mother Nature. Remember, it is better to underwater than to overwater. Most problems with plants come from overwatering! It's time for us to plant spring bulbs and decorate your landscape with mums to add fall color. Contact us for an estimate. Enjoy the winter interest in your landscape and wait (impatiently) for spring! The term given to soil which has become impenetrable because of foot traffic, construction etc. Why do landscapers exist and what will that do for my home or business? 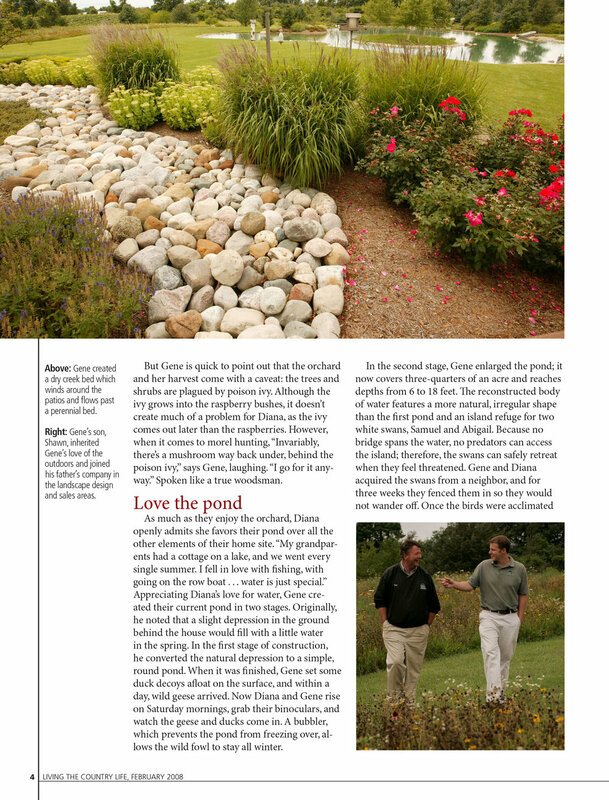 Well designed landscaping will give you more than a few plants around the foundation. 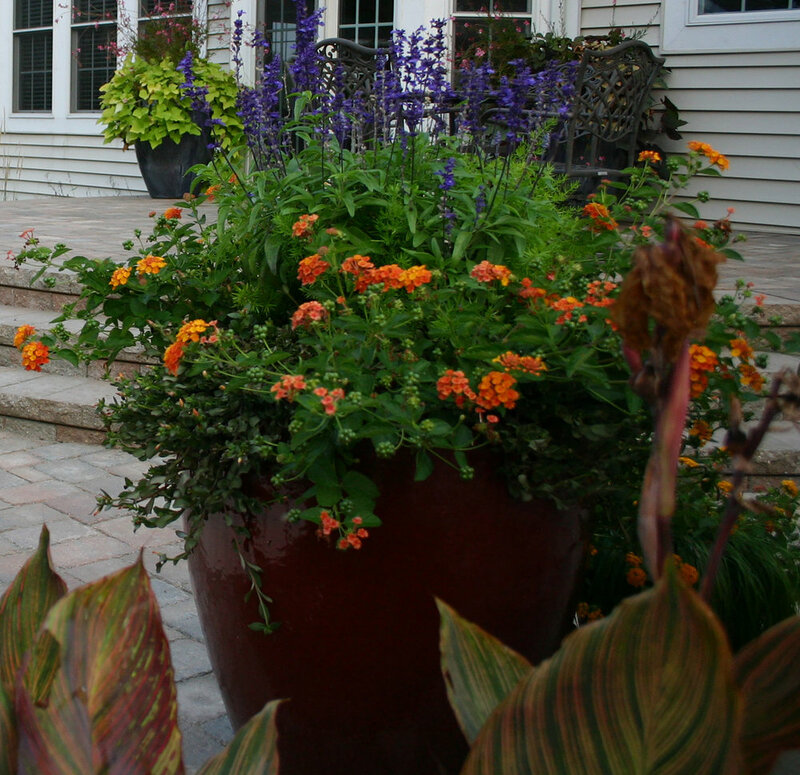 Landscape designers have the responsibility to bring all elements of the exterior of your home together in a way that will benefit and enhance the investment you have made. As plantings increase in size, they will also increase in value. However, the wrong plant in the wrong place will actually decrease in value. That is why dealing with a competent landscape designer will actually save money and greatly improve the chances of the landscaping appreciating in value in the years ahead. Generally there are 5 phases: Discovery, Design, Construction, Maintenance and "Enjoyment". How much will it cost to landscape my home or business? The particular needs of each landscape project vary making it hard to provide an accurate estimate until the job has been measured and your goals for the project have been defined. How long does it take to landscape my home or business? Because each project is individualized to meet your needs and goals, the timing of each project differs. What kind of guarantee will Nature's Way provide? Aside from natural disasters, we stand behind our work and that is a crucial factor in our success. After creating landscapes in the area for 35 years, there are several places that you can see our work in person. We invite you to do so. Nature's Way takes pride in our wide selection and use of unusual plantings, always ensuring that they will survive in our Plant Hardiness Zone 5/6. As you might guess, with the meticulous effort that is put into the design and construction of our landscapes, we have no problem guaranteeing our work. All of our plant material is guaranteed for one year from the date of installation. What do I need to do when the landscape is complete? The landscape is never complete. From here begins a lifetime of evolvement as things grow and provide different qualities throughout the year. We say "Sit back, enjoy, and watch it grow!" Of course you are now part of our family and we will be there to offer some guidelines when it comes to watering requirements, maintenance, pruning or fertilizing. Can Nature's Way offer a helping hand to maintain their creation? Of course! Part of our signature style and philosophy is that you should be enjoying the landscape and not enslaved by it. When designing, we use plants for certain areas that should be left alone and not often tended to throughout the season. The best landscapes are essentially left alone. We intend for plantes to be in mass. To achieve this, mulch is used. Mulch should only be used to aid the plants to grow and fill in. In turn, the end goal is to eliminate the overall need for mulch once the plants have filled in. Although there is no such thing as "no maintenance", with the correct maintenance we can eliminate many hours of struggle. If you find that you don't have a green thumb - Nature's Way is always happy to help with maintenance, especially in the spring and fall when gardens' require the most work. Should I become part of the Nature's Way family? We'd love to have you! After 35 years, Nature's Way Landscaping definitely has a recognizable style and it's also the #1 reason why our clients hire us. We like to describe it as simple and relaxed, but in reality every little detail we design is on purpose. The outcome is something special - a rhythm in nature specific for the location & style of your home as well as your lifestyle. We are always striving to think of new and creative environments that you won't find anywhere else. 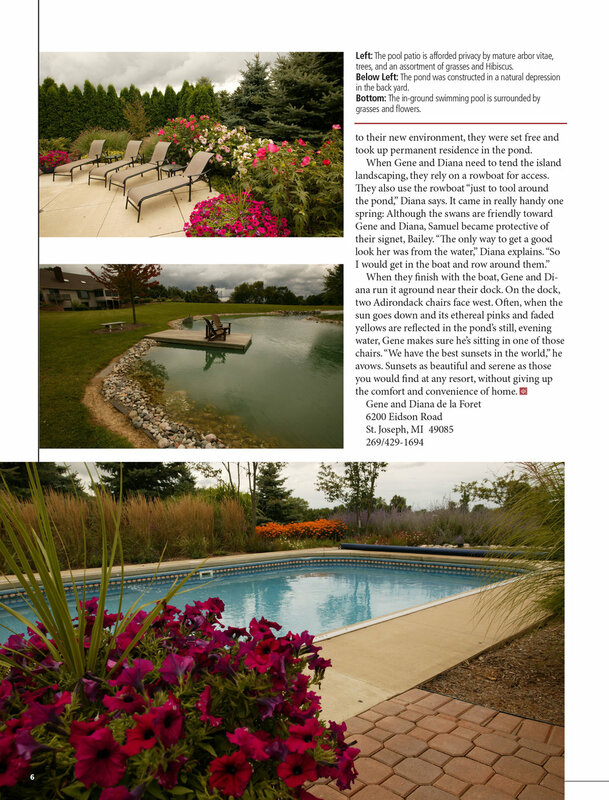 We pay extreme attention to detail and we always design your landscape for all four seasons. 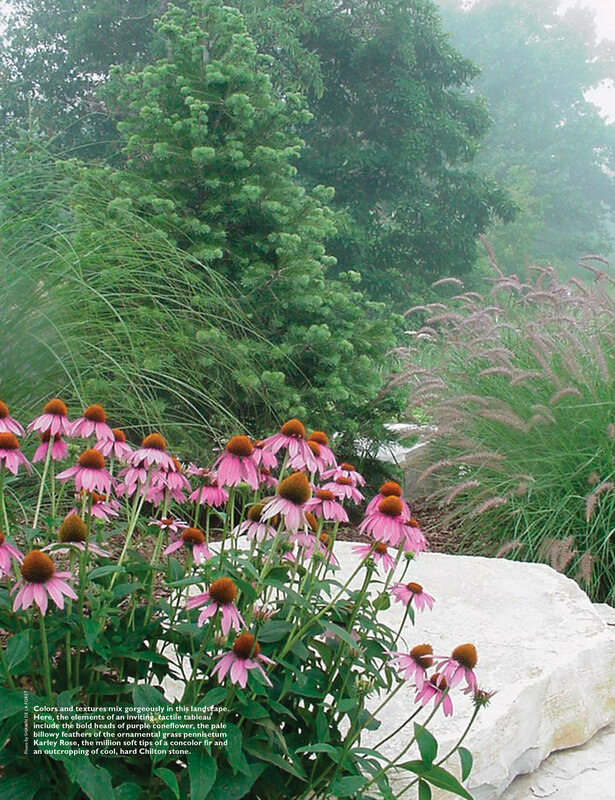 We accomplish this through the use of mass plantings of perennials and grasses, balancing it off with the use of evergreens, trees and shrubs, which provide the framework for the breathtaking views we create. The framing of views is one aspect of design that can lead to the most exciting discoveries. Each angle from which you view your landscape will look surprisingly different. We like to call this "the element of surprise." It is this element of surprise that will entice you to journey around corners to the different areas and outdoor spaces we have created to see your home as never before. This is what you can expect with a partnership with Nature's Way. When the project is complete, you will see that it has only just begun. New uses for the beautiful spaces that we create will be discovered over and over as time goes on.